An international team of astronomers has discovered a new super-Earth planet in the habitable zone of a nearby star. It is one of three new super-Earths found in orbit around a star already known to have three other low-mass planets orbiting it. The previously discovered planets were hot super-Earths orbiting far too close to the star, known as HD 40307, to support life. The researchers, led by Mikko Tuomi of the University of Hertfordshire and Guillem Anglada-Escudé of the University of Göttingen, used a new procedure that allowed them to detect the signals indicating the presence of the three additional planets. They presented their findings in a paper to be published in Astronomy & Astrophysics and posted online at arxiv.org/archive/astro-ph. "This result marks an important new milestone in our capability for finding Earth-sized planets around the nearest stars," said coauthor Steve Vogt, professor of astronomy and astrophysics at UC Santa Cruz. "We are finally beginning to understand the nature of the radial velocity noise from the stars themselves that has so far been masking very weak exoplanet signals. By filtering out this stellar noise, and through the use of advanced mathematical analysis techniques, we are finally able to tease out these extremely weak signals, revealing potentially habitable Earth-sized worlds around our nearest stellar neighbors." Of the new planets, the one of greatest interest is in the outermost orbit from the star and has a mass at least seven times the mass of the Earth. Its orbit around the host star is at a similar distance to Earth's orbit around our Sun and is well within the star's "habitable zone," where it is possible for a planet to have liquid water and a stable atmosphere. The researchers said the planet is also likely to be rotating on its own axis as it orbits the star, suggesting that it might have a day/night cycle that would be conducive to creating an Earth-like environment. 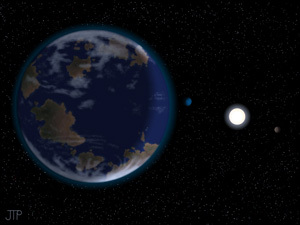 "The star HD 40307 is a perfectly quiet old dwarf star, so there is no reason why such a planet could not sustain an Earth-like climate," said Anglada-Escudé. Earlier this year, NASA's Kepler spacecraft found a planet with a similar orbit, called Kepler 22d. It is located 600 light years from Earth, however, whereas the new planet HD40307g is much closer, at 44 light years from Earth. The team based their results on reanalysis of spectra taken with the HARPS spectrograph and available through the European Southern Observatory public archive. The researchers acknowledged the significant efforts of the HARPS-ESO team in improving the instrument and its data reduction pipelines and obtaining the observations that made this work possible. The coauthors of the paper include Tuomi, Anglada-Escudé, and Vogt, as well as Eugenio Rivera of UC Santa Cruz, R. Paul Butler of the Carnegie Institution for Science, Hugh Jones of the University of Hertfordshire, Enrico Gerlach of the Technical University of Dresden, and Ansgar Reiners of the University of Göttingen. This research was funded in part by RoPACS (Rocky Planets Around Cool Stars), a Marie Curie Initial Training Network funded by the European Commission; the German Ministry of Education and Research; the German Research Foundation (DFG); and the U.S. National Science Foundation (NSF grant AST-0307493).